Today we’d like to introduce you to Dorothy Englander. I am a resident of Albany NY and have enjoyed summer stays in Gloucester, where I have had a studio, for over fifty years. I have family in Brookline and Littleton, and plan on relocating to MA. Recently, two of my works were included in the national show “Red, White + Blue” at the Brookline Arts Center. As a child, I was always “making things”; I enjoyed knitting, sewing, constructing paper houses, and making paper dolls and their clothing. I played the piano from age 6. I lived in Providence, and my first art lessons were at RISD. After marrying at age 18, and then raising three children, I went back to school and earned a BS in art at Skidmore College (many years after my original class year there), and an MFA in drawing and painting at the State University at Albany. As an undergraduate, I worked doing custom painting on clothing and accessories for a boutique. I taught drawing in grad school and was an assistant in undergrad painting, and then taught drawing and painting as a college adjunct. I have been a resident artist in public schools, and have taught at arts centers and senior centers. I studied Intermodal Expressive Arts Therapy at the European Graduate School, Saas Fee Switzerland, and practiced as a creativity coach and as an expressive arts teacher in schools. My images have been used on magazine and book covers, and a painting is reproduced in the book Artists’ Dreams, edited by Donald Kuspit et al. 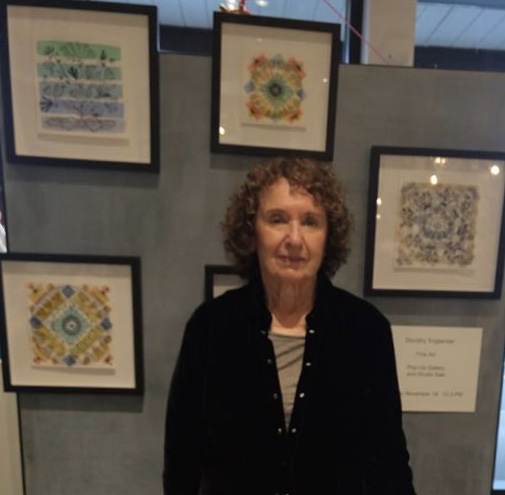 For over three decades, I have exhibited my art in solo and group shows, regionally and nationally, and have been awarded several purchase and juror’s awards. 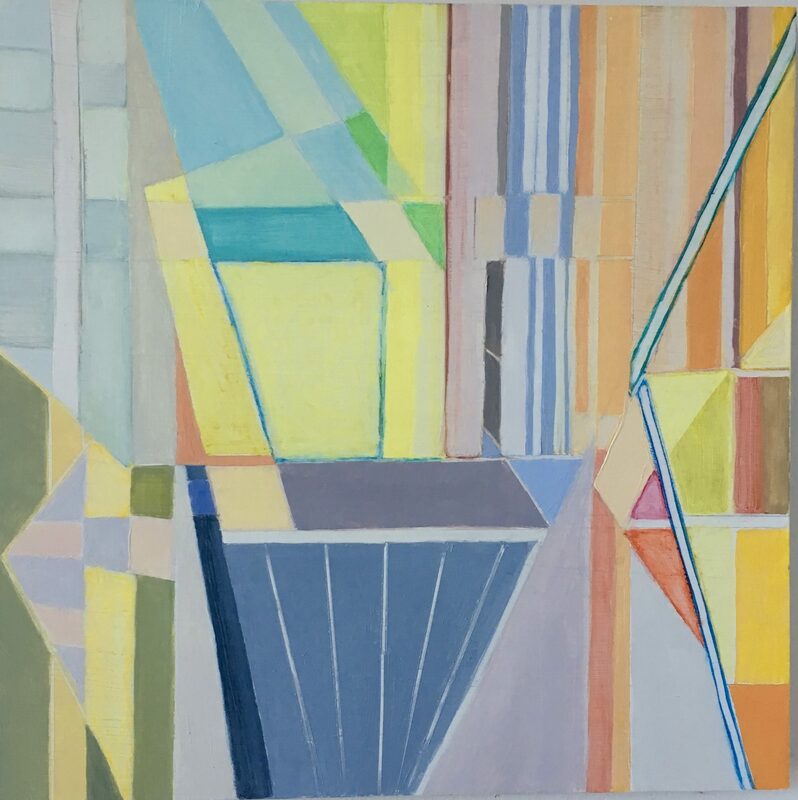 My works are in the collections of the Hyde Collection, the University at Albany Museum, the Helene Wurlitzer Foundation, the New York Sate Comptroller, and numerous corporate and private collections. 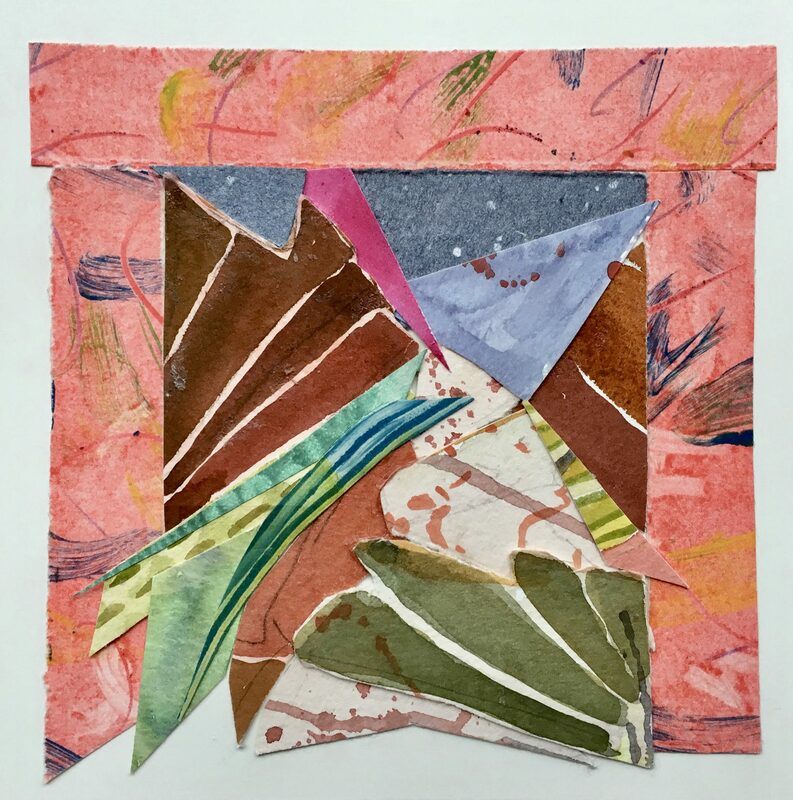 I have had artists’ residencies at the Vermont Studio Center, the Helene Wurlitzer Foundation in Taos NM, and the Contemporary Artists Center, N Adams. 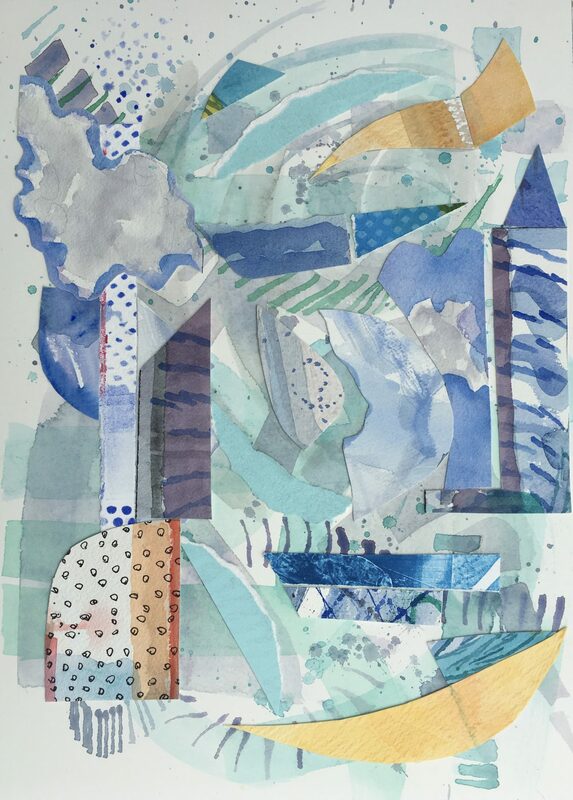 Abstraction and collage have always had roles in my work, as have whimsy and playfulness. 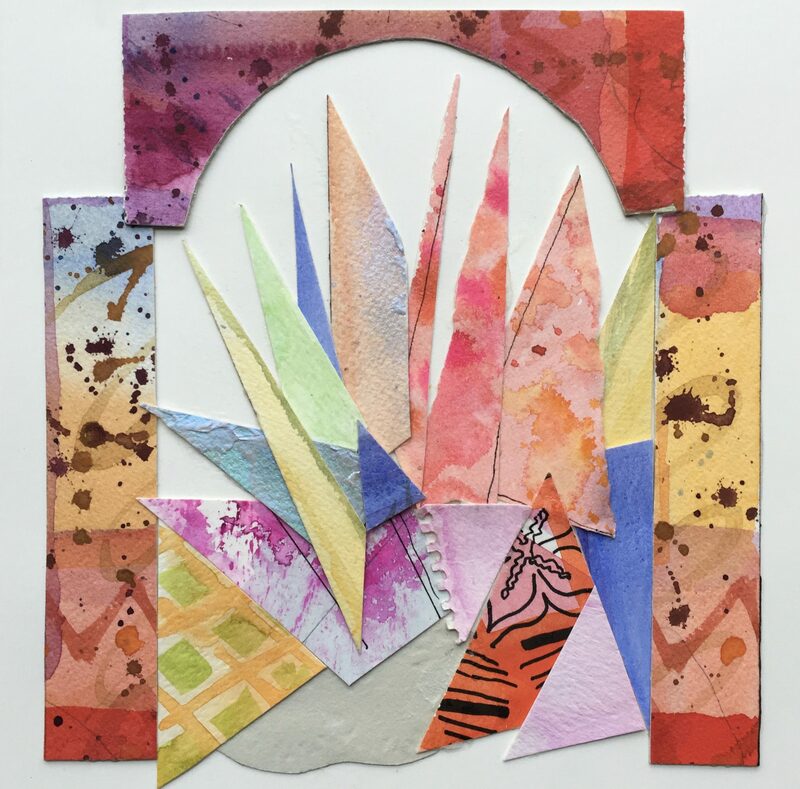 My current practice focuses on collage, using fragments of watercolor, gouache, and ink drawings, handmade paper, and other media. I start with a color scheme suggested by existing paintings that I repurpose or painted papers. 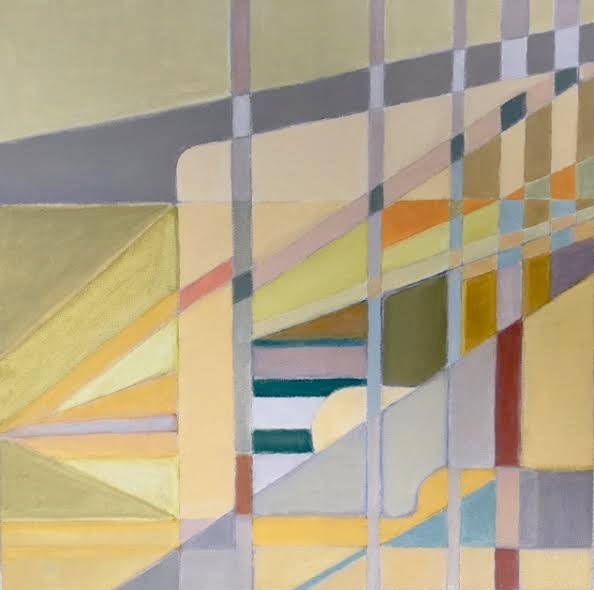 I assemble shapes that I cut and tear, finding surprise connections, compositional relationships and configurations. 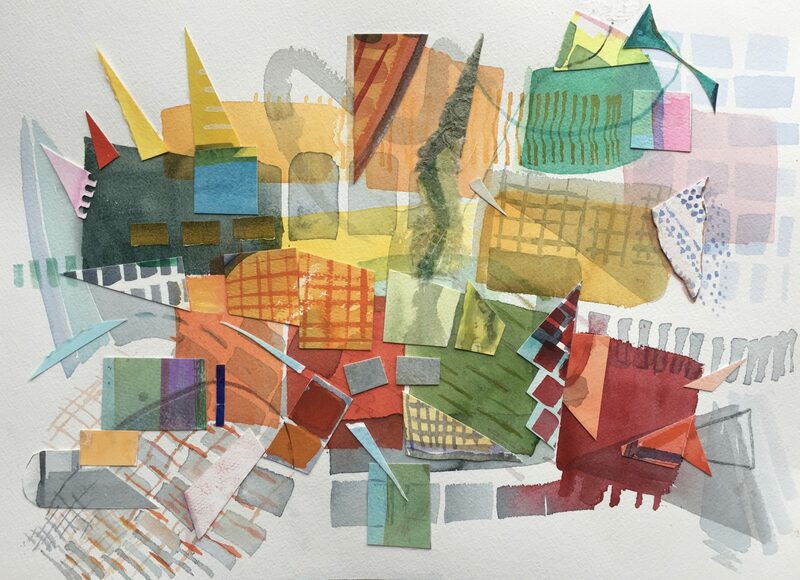 I may immediately create compositions, or start with an abstract watercolor painting that serves as an underpainting for a collage with related shapes and colors. I work collaboratively with a colleague on digital and hard-copy collages, which we have practiced for many years. Currently, we mail small collages in progress between NY and AZ. Our collaboration was initially inspired by the “Exquisite Corpse”, a surrealist project in which French writers contributed collectively to one another’s work. 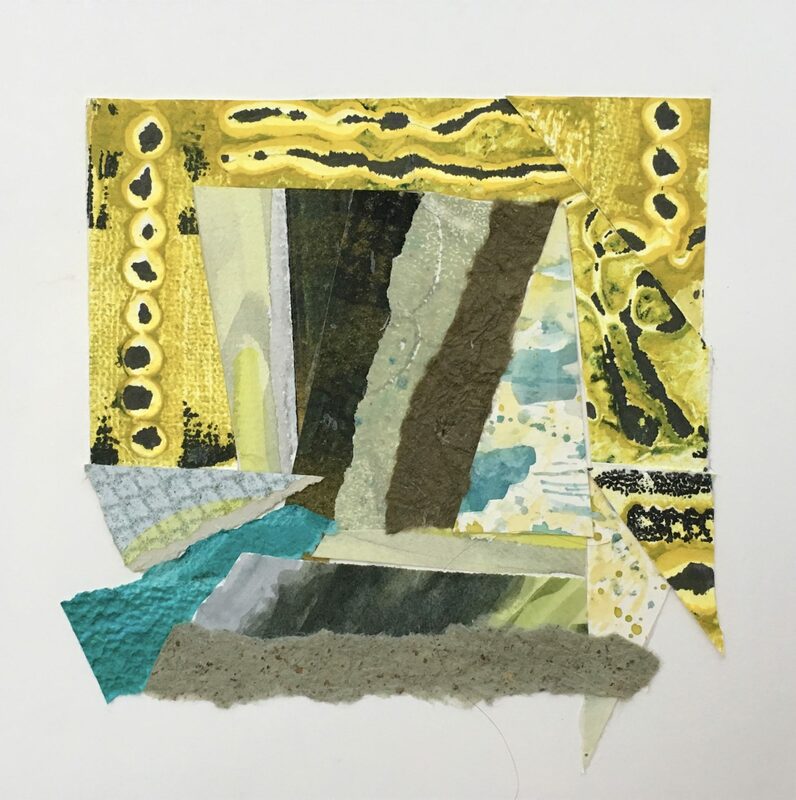 Collage serves as a way to unite disparate parts until a new image emerges. In a curious way, this process mirrors how one combines contrasting aspects and challenges of life into a version of unity that allows us to forge acceptance, growth, and change. I am starting a series of oil paintings on canvas and panel. As a young student, I was a biology major. Images based on landscape, lichens, petroglyphs and microbiology occur in my work, reflecting my ongoing interest in science and nature. My drawings, paintings and monotypes in ink, watercolor, acrylic, and oil have sources in observation, memory, and invention. Throughout history, artists’ works have often reflected current events and attitudes. From cave paintings related to hunting animals for sustenance, to paintings, sculptures, and installations and murals of modern times, artists have interpreted the world around them. Some of my recent images reflect my reactions to the absurdities and stress of the last year and a half in politics. 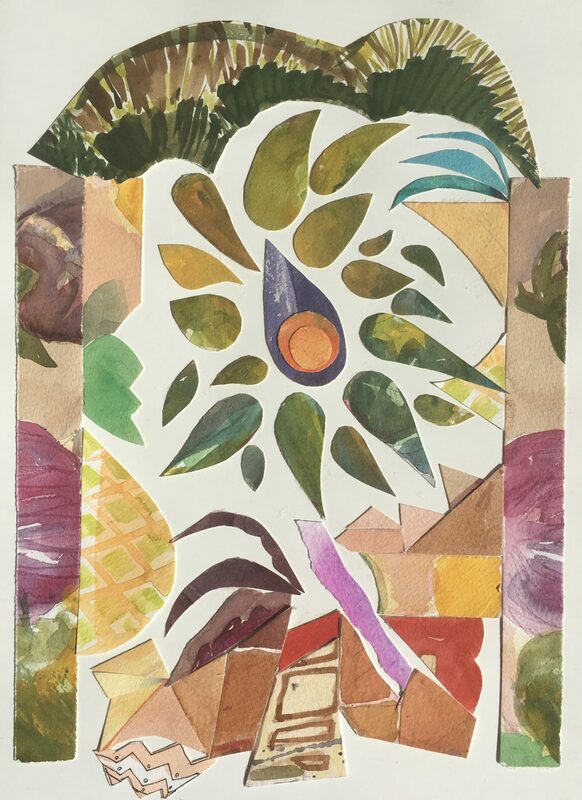 Small abstract collage compositions, such as “Surveillance and Broadcasting Device” suggest politically related images and Orwellian ideas resembling the current presidential administration. A collage configuration that recently took shape in my images resembles a theater curtain/stage. This brings to mind the “Theater of the Absurd”, a form of theater by playwrights Ionesco and Beckett, defined as “A form of drama that emphasizes the absurdity of human existence by employing disjointed, repetitious, and meaningless dialogue, purposeless and confusing situations, and plots that lack realistic or logical development.” This raises the idea of a resemblance to our current government’s activities; thus, several of my collages have the title “Theater of the Absurd”. Issues related to climate change, the oceans, land misuse, etc. are suggested abstractly. Following a high school shooting, collage fragments suggesting the shape of an assault rifle has prompted me to realize a patterned piece, titled “Homespun Gun”. Currently I have a solo show, curated by the Albany Center Gallery, at 3 Fish Coffee in Albany NY. In July and August, I will have an oil painting in a group show at the Arts Center of the Capital Region in Troy NY, as well as three 10 x 10” works at the Arts Center in Saratoga Springs NY. I have shown widely at area galleries and arts centers and in national exhibits. In summer 2018 I’ll be back at Cape Ann, in Gloucester, where I’d welcome studio visits. Some of the venues where I have exhibited include The Hyde Collection, the University at Albany, the Church Street Gallery, Lenox; the Berkshire Museum, the Williamstown Gallery, The Berkshire Museum, The Brookline Arts Center, Greenhut Galleries, Albany Center Gallery, Sage Colleges, Skidmore College, the Martinez Gallery, and Scarlet Seven Gallery. To see my work, please contact me through my website, by phone, or at doroart2@gmail.com. All images displayed on Boston Voyager, and most on my website, are available. All images property of Dorothy Englander.